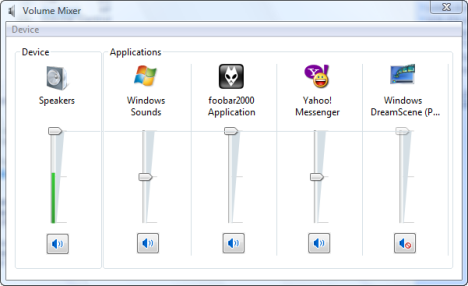 The old Volume Control from Windows XP was replaced in Windows Vista, 7 and 8 by the Volume Mixer. The new application brings to Windows much more flexibility regarding the sound management of the different applications you have installed on your PC. In Windows XP the only feature of the Volume Control was to increase or decrease the general system sound level. In Windows Vista, 7 and windows 8, the Volume Mixer is capable of managing sound settings for each multimedia application installed on your PC. To access the Volume Mixer you have to click on the small volume icon from your taskbar. To access the volume mixer in Windows 10, click the small search icon (magnifying glass) in the bottom-left corner of the screen and search for "adjust system volume". At this point the Volume Mixer looks almost the same as in Windows XP. Here you can increase or decrease the sound level of your system. If you want to make individual application settings, click on the Mixer link. As you can see in the below screenshot, the Volume Mixer will load a list of all the running multimedia applications. To configure the sound settings for each application move the level up or down. To mute/unmute an application, just click on the speaker button beneath it. BUT !!!!!! How about your bass and treble settings ?????? I can't find them. Please help. How to enable line in? I can see it in the recording panel, but not the playback panel in the volume mixer. Any ideas? The line in definitely is definitely working as i can record the sound, but it doesn't play the sound "live". Hope I'm making sense. vedel, the Volume Mixer doesn't have bass or treble controls. You can control those settings thru Winamp, Foobar or any other third party software that has support for those settings. 1. Open Audio Devices and Sound Themes by clicking the Start button , clicking Control Panel, clicking Hardware and Sound, and then clicking Sound. 2. Click the Playback tab, click Speakers, and then click Properties. 3. Click the Levels tab, and then, under Line In, click the Mute button to enable sound for the line-in connection. George, I need your help. I followed your steps. But at the third step, I couldn't find Line In, mic, or etc. It's only Speaker/Headphone displayed there. How can I enable the line-in? The line-in and mic are only displayed on Recording tab, not the Playback tab (step 2). So, how can I hear the sound from line-in or mic directly, without recording it first. Thanks. Sorry about my bad English. Thank you so much!!! M$ have made things so difficult in Vista. How can I switch automatically from speakers to headphones (normal non-USB ones). It used to work but now, I have either to set the one of the other as default or (doesn't always work) simply restart the application. Any settings somewhere? I use a voice chat program called Ventrilo and I wanted to play music in our music channel for my friends. So I got the instructions on how to and windows vista doesn't have a stero mix selection in Ventrilo. So I figured Line in was what I should use and I can not get my Line in, in the control panel to set to "working" and not "currently unavailble" Is there something I am missing? how to readjust windows vista in delphi programming? Yea I tried that several times and it still is set to "currently unavailble" starting to think this is inpossible using window's vista. for some reason my volume tab has dissappeared from the tabs in the lower right corner next to the sound. how to i get to the volume mixer to adjust the sound and return the tab into the taskbar? Check our article on How to configure the Taskbar and the Start Menu. Right click on your taskbar and select Properties from the menu. Then go to the Notification Area tab and select the system icons you want to appear in the bottom right corner. There you will find the Volume icon. Did you install the sound drivers and... did you plug your sound system into the right jack? I click on the speaker button beneath it and all it says is that 'No audio device is installed' How can I fix this? You have to install the drivers for your soundcard. If you have a dedicated or onboard soundcard, you can find the drivers on the manufacturer's website or on the CD that came with the soundcard or with the mainboard. I understand the basic of XP & Vista Volume. However the volume mixer on Vista will not let me turn up the volume on my Logitech 350 Premium USB headphones. Anyone have any ideas where Vista would not let me increase headphone volume , but whenever they are removed I can adjust the volume for my PC speakers? Sigmatel Driver and NO Line-In Playback!! I used my x360 to play through my pc setup, ie, picture through my monitor and sound trhough my speakers, in xp and it worked fine. Now i am on Vista and there is no way for me to get sound through the speakers from the line in, ie there is no plackback. I have heard of some people having an extra option in the speaker properties to adjust line-in plackback volue, but these are people with realtake drivers, i have got sigmatel and there is nothing for me to check or un-check to get sound playing through my speakers from the line-in. Any ideas? I need help, need to play COD4!! You cannot do that from the Volume Mixer. Maybe your sound card or sound system has some application from which to do that kind of configuration. But... by default you won't find it in Windows Vista. I use camfrog and wanted to be a DJ in one of the chat rooms but apparently i need to do this through a stereo mixer? Vista doesn't have this i have been told so how can i be a dj in a chat room apart from holding a mic to my speakers? If the stereo mixer still exists can anyone tell me where etc? I wish to set a pair of headphones attached to the back of the computer as my default sound device. I can set them to place going through the control panel to realtek and clicking on the blue minijack sign then checking the headphone box. But every time the computer is restarted there is no sound and it has to be set again. How can I set the headphones to be the default speakers? To enable the microphone playback, you need to edit registry. Go to " run" in the start menu, and type "regedit". "disablemicfromplayback" shows a 01 value. Change it to 00. "disablemicselect" shows a 01 value. Change it to 00.
complete for both registry lines. and you add it as an available slider, it will be muted. I have excatly the same problem. Vista ultimate with an ASUS P5E motherboard and onboard sound device. I have installed the latest sound max drivers, however, sound in firefox does not play. It works fine in itunes, windows media player, winamp, etc... I have all the plugins for firefox i need.. It seams to be a volume mixer problem in Vista. Anyway to kill the volume mixer and set it back to the XP style?? the new volume mixer is nothing but buggy!! George, Thanks for the WinAmp suggestion. It worked (or should I say, it is working). I am familiar with WinAmp from previous Window applications. Since WinAmp has been reliable in the past, I had no qualms about downloading this program into my new computer system. Hey just want you to know that I have the same issue and it is very annoying. Sorry I don't have a fix but just want you to know your not alone. how do I get sound from my guitar to play through headphones? I can record and play it back but cannot hear it before and during recording? I imagine it would be the same process as hooking up an mp3 player to play through computer to speakers without directly plugging the speakers into the player. Is there a menu in vista to enable the mic input to be heard directly like this? I bought a new computer with Vista. Worked fine for a couple of weeks, but now none of my applications have any sound. The Windows sounds are still working fine, but if I open the volume mixer with applications running, it no longer shows any applications except for Windoes Sounds. It's as if the Vista sound component cannot see any applications. The only thing I can think of that might have caused it is that I installed Roxio Creator 10.
hello, i have a problem i can't get a microphone audio out on my laptop but the microphone audio in is ok and the microphone properties and volume is not in the volume mixer what can i do? Just curious, I'd like to record with some reverb. Is there a free software download somewhere of a mixer for that use that I can use with Vista. Feel free to email. Thanks! When I try to use the volume mixer in windows vista, I am able to set the sound level for those windows sounds at an appropriate level, however, after some time, the volume level of the windows sounds seems to re-adjust itself (to a level I find too loud), and I have to go back in and adjust the sound level over and over again. Does anyone know how to lock in the sound level for once and all? ok i can hear music and ppl in my chat rooms and even on media palyer but...... when i try to play music in my rooms they can not hear it and when i try to use my mic they can not hear it. when i click show disabled stuff i have nothing there so how do i fix this problem. Scroll to the right. You might have too many programs running and it was moved to the right of the list. Not there, I only see speaker and Windows sound or if I open WMP or something on the web. Outlook was there, I did a quick adjust because mail notification was really low. then I upgraded the sound driver and now it is gone. I even did a system restore to before the driver upgrade.